MLK rolling over in his grave. A number of protesters staged a “die-in” at the state’s official event honoring Martin Luther King, Jr.’s legacy to demand changes to police practices. 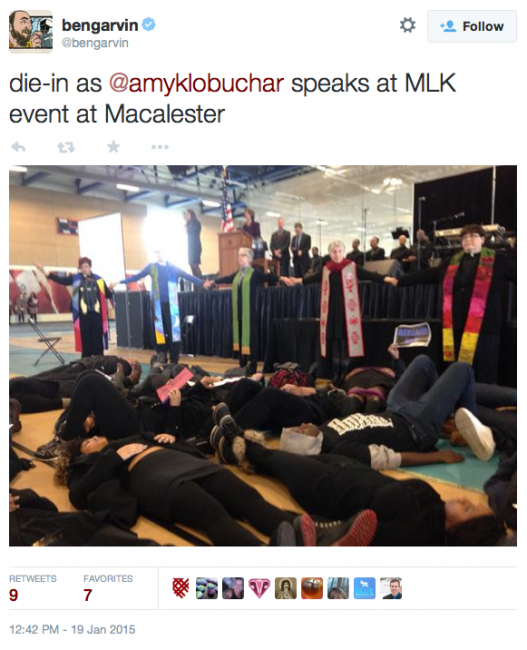 The protesters also joined hands and held signs bearing messages such as “White Silence = Violence” as politicians such as Sen. Amy Klobuchar, Rep. Keith Ellison, and Sen. Al Franken addressed the crowd at Macalester College Monday morning.